Welcome, welcome, welcome everybody to Top Line Live at Five! My name is Brian and I am here to be talking about something that’s a little bit different than what we usually discuss and that is the question, “Are you attracting the right type of patient into your practice?” Are you able to get the right types of people coming in to see you? The reason that I’m bringing this up today is because it might sound a little strange and existential but I had a mentor of mine recently kind of bring that up and just asked me about the types of people that have been coming into the business. Because, lately we’ve been getting some great people. We’ve had just wonderful people early on in the business and that have stayed with us for years.S,o we were talking about how that happens and how we go about making sure that continues to happen, that we continue getting such great people to come and work with us here at Top Line. It got me thinking about some of the clients that I’ve worked with recently that they’re patient bases, not exactly their ideal patients. They’re not attracting the kinds of people that they necessarily want to keep attracting. The weird thing is that when you don’t know exactly who it is you want in the practice. If I were to say to you, “Hey, what’s your ideal patient?” You say, “Anyone that has a need, that can pay well.” That’s actually a problem. It might sound like that means you can just work with anybody but what it means is that you are not actively attracting the the exact kind of people to you that you want. It is such a strange thing when you really take the time to figure out exactly who your ideal patient is and really laying that out. Maybe it’s several different kinds of people. Maybe there’s not just one ideal patient but there could be certain types of people. When you take the time to actually write that out and say, “Here is the ideal person to come into this practice and here’s ideal person number two and here’s ideal person number three.” We want to make sure that those are the kinds of people that we bring in. What happens is two things: Number one is your language. Your marketing. What you put out there. Now, it’s more specifically geared towards bringing those people toward you. The other thing and it’s going to sound weird and you think I’m crazy send me a message here and tell me that I’m crazy. 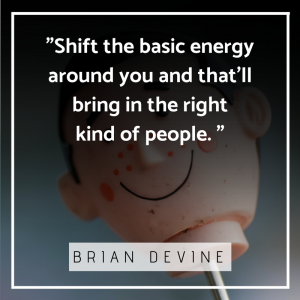 But what I see happen is that when you do that, that you actually shift just the basic energy around you that brings in the right kind of people. I know it just sounds ridiculous and I’d be the first person to tell you but that it’s ridiculous. I have just seen it so many times. Now, that you just can’t deny it. Now, I obviously think that when you take the time to do this, you’re kind of retooling your brain. You’re also retooling everyone in the practice that works there to be thinking about the ideal person to come in. When everybody is in agreement and everybody is working towards that same goal and everybody is thinking about this is the ideal patient, these are the people that we want to bring in. What happens is the way that you answer the phone starts to shift. So, that brings those people in. The way that you write any copy starts to shift to bring those people in. The offers you consider brings those types of people in. So, it’s sort of this all-encompassing system that ends up coming into play. It really kind of struck me recently when we started thinking about when we were absolutely driving so great. An exact person that we wanted was coming in consistently. I know we were finding that wasn’t quite the same and what happened was I would shift from “Hey, we’ve got this new same in this new system. Let’s get some these people going.” That didn’t work nearly as well. As I’ve got this great new system, it is ideal for these kinds of people. When they come or if they’re already in place, we’re going to offer it and we’re going to grow organically. If you think I’m crazy, please let me know and if you think that I’m right, if you’ve seen this yourself, I want to hear from that about that too. Give me your stories. Let me know what you’re thinking. Alright! That’s it for today. Have yourself a wonderful weekend and I look forward to seeing you next time on Top Line Live at Five! That’s it for me. Bye for now! Need Help With Content For Your Practice's Social Media and Blog?